Since I have lived in and enjoyed the Sarasota area for 16 years, I felt it was time to write about my adopted hometown. Every time I return home from my travels, I am reminded that it’s not only a great place to live, but also a wonderful place to visit. Many tourists love it so much that they eventually settle in the area because it is the cultural and scenic gem of Florida’s west coast. Located on the Gulf of Mexico just an hour’s drive from Tampa and less than four hours from Miami, the area is justly proud of its extensive arts and culture resources. Its pristine, award-winning (and free!) beaches and beautiful waterfront vistas draw simply smart vacationers back again and again. Throw in impressive culinary resources and a growing shopping and international sports presence — the IMG Academy trains athletes from around the world, and the world-class Benderson Park Rowing Facility will host the 2017 world rowing championships — and you have a winner. The cities and suburbs of Sarasota and Bradenton form a metropolitan area of about 750,000 people with an enviable quality of life. Together, they are frequently referred to as the Suncoast. Read one of the Lew Fonseca novels by the late Sarasota author Stuart Kaminsky. Sarasota International (SRQ) is 11 miles from Sarasota and eight miles from Bradenton. Tampa International (TPA) is 44 miles away via by Interstate 75/275. The nearest cruise port is Tampa, about 50 miles away. Going by train is possible from Atlanta. The closest station is Tampa, and a charter bus connects you to downtown Bradenton and Sarasota. I-75 runs through the region. 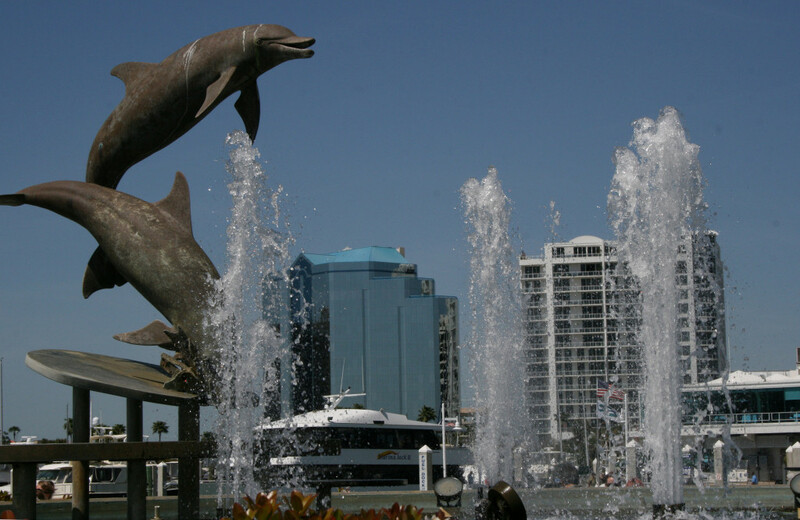 Sarasota’s Bayfront Park is a popular place to walk, dine and enjoy the water. Unless you enjoy long waits for buses in the hot sun or finding almost-nonexistent taxis, a car is a must. Free parking is available in most places. 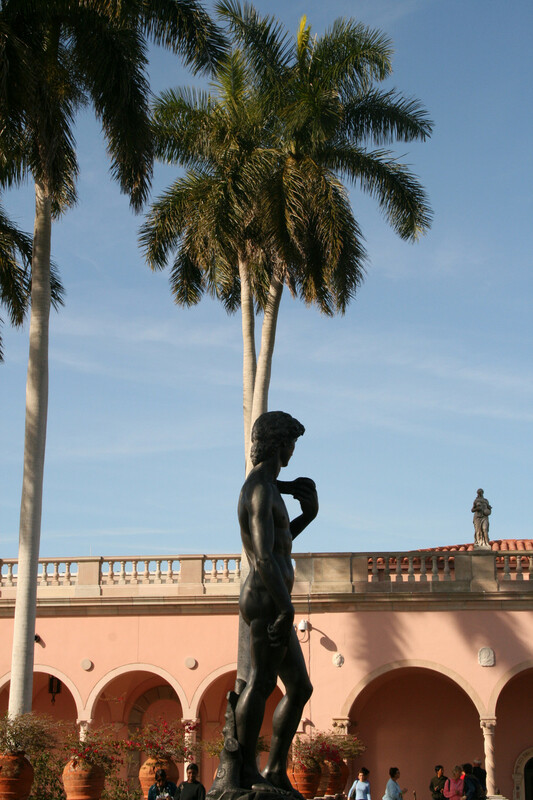 The Ringling Museum (art, circus and the gorgeous Ringling mansion). The bayfront along U.S. 41 and the bridge to St. Armands Circle (shopping, eating). University Town Center and Lakewood Ranch (upscale mall, restaurants, competitive rowing facility and an adjacent planned community). Siesta Key’s public beach and/or Venice, Turtle, Lido, Coquina and Bradenton beaches. Lunch or dinner at Michael’s On East, Marina Jack or the Beach Bistro. Downtown Bradenton with the South Florida Museum, Old Main Street and the Riverwalk. 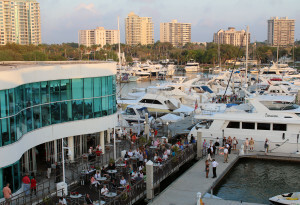 Take a sunset or afternoon cruise on LeBarge or the Marina Jack, both docked at the Sarasota bayfront downtown on U.S. 41. 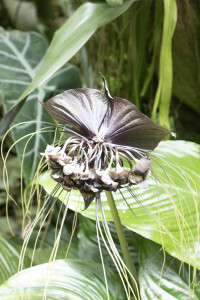 This is one of the rare orchids at Selby Gardens. A circular drive from downtown Sarasota to St. Armands, north on the barrier islands (Longboat Key, Anna Maria), west on S.R. 64 to Bradenton, and south on U.S. 41 back to downtown Sarasota. Casey Key, Venice, Punta Gorda and Boca Grande to the south. Tampa, St. Petersburg and Clearwater to the north, including Busch Gardens, museums, the zoo and the Florida Aquarium in Tampa. Mote Marine (aquarium and science center). Selby Gardens, a breathtaking collection of tropical plants in a gorgeous, bayfront setting with great views. A walk through the Amish/Mennonite Pinecraft neighborhood. More waterfront dining (Beach House, Mar Vista, Old Salty Dog, Pier 22, Riverhouse Reef & Grill, Seafood Shack and Sharky’s on the Pier in Venice, to name a few). Bring comfortable and fashionable sandals, walking shoes, a bathing suit, lightweight clothing, and a folding sun hat that can fit in a purse, and think resort casual in your dress. Shorts and casual clothes are fine for shopping, museums and many restaurants. Women should pack at least one dressier blouse, a lightweight skirt, and a lightweight wrap for evening wear, the arts and upscale dining. Men require no jacket and tie, even at arts events. 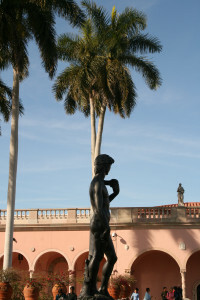 David, seen in the courtyard of the Ringling Museum, is the symbol of the arts-oriented city of Sarasota. Mobility level: Suitable for travelers of all ages. The Suncoast has a large senior population and throngs of 50-plus visitors, so the area caters to them. Elevators, free shuttles at the Ringling grounds and an island trolley service make getting around fairly easy. Expect to walk at St. Armands, Sarasota Main Street and the Bradenton Riverwalk. When to go: Any time. Summers are hot and sticky, like Atlanta. But restaurant lines and traffic are lighter, and the cultural scene is still functioning, albeit at a lower intensity than in the winter. The Fourth of July offshore powerboat races attract big crowds. High season runs from Thanksgiving through Passover and offers gorgeous weather (especially in November and March) and an amazingly full cultural calendar. Where to stay: The Ritz-Carlton Sarasota is pricey but nice. The new Hampton Inn in Bradenton is a good choice. There are many good beachfront resorts on the barrier islands, and a multitude of national hotel brands are found along I-75 and near the Sarasota airport. Special interests: Culture — art, music, ballet and theater abound. The beaches are world class. Jeffrey R. Orenstein is a syndicated travel writer who lives on Florida’s West Coast. He and his wife, Virginia, enjoy simply smart travel and writing about it. Check out their travel ideas, articles and blog at www.SimplySmartTravel.com.